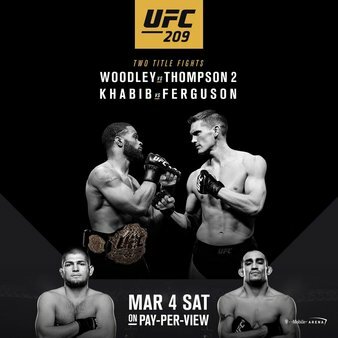 UFC 209 is the second UFC PPV event for 2017 but certainly the biggest so far. 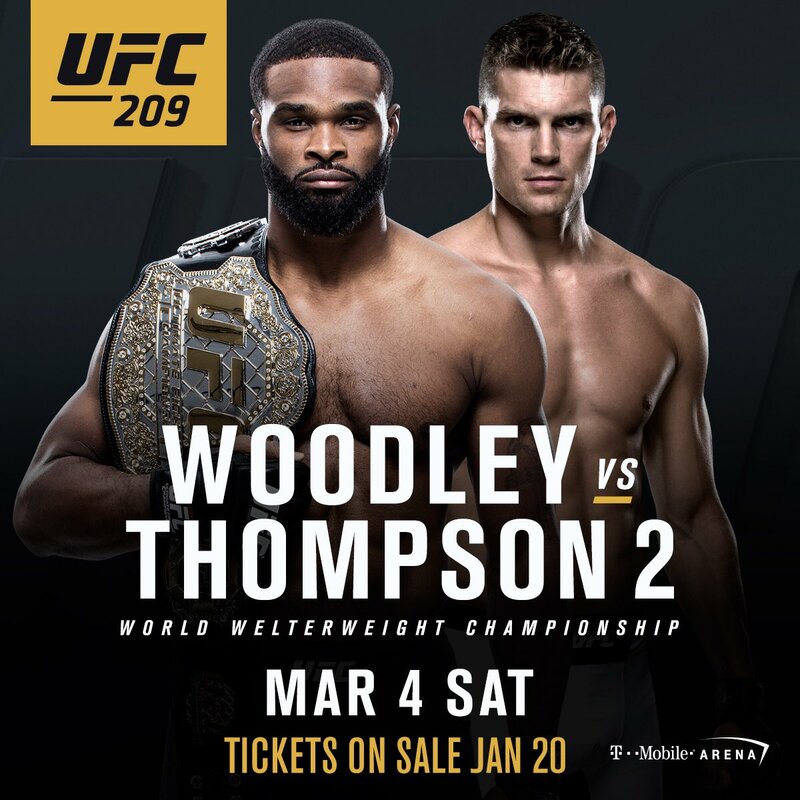 It’s features in the main event a rematch for the Welterweight title between Tyron Woodley and Steven “Wonderboy” Thompson. Their first fight ended in a draw. The Co-Main was for the Interim Lightweight Title between Khabib Nurmagomedov and Tony Ferguson, but that fight was called off. due to issues cutting for Khabib. We also have the return of Rashad Evans taking on Dan Kelly plus a heavyweight rematch nine years in the making between Alistair Overeem & Kiwi Mark Hunt. The prelims features a nice mix of weight classes from the big boys at heavyweight (265lbs) to the ladies at Strawweight (115lbs). Calvillo by 2nd Round TKO – This fight was moved to the main card following the cancellation of the co-main event and so we don’t know much about these fighters. Amanda Cooper (pictured below) was on the ultimate fighter and has a 2-2 record as a pro, wins on the ground both on TUF and as a pro. Cynthia Calvillo holds a 3-0 pro record and this is her UFC debut. 2 wins by tko or ko. Her main selling point is that she trains at Team Alpha Male. Close fight but we see Calvillo picking up the debut win. Mark Hunt by 2nd Round TKO – A rematch 8 years in the making from back in the more brutal Pride days. Mark Hunt has been very outspoken about his issues with the UFC, but fights Alistair Overeem. Both have lost title fights in the past year or so. We see a slow early round with Hunt finishing it in the 2nd by TKO maybe KO. Lando Vannata by 1st Round TKO – This is an interesting fight between two up and coming lightweights. Lando Vannata 9-1, with the only loss against Tony Ferguson. TUF Vetern David Teymur from Sweden has less experience but has finished his last two fights in the ufc. Expect a standup war, that might not go beyond 5minutes. Rashad Evans by Decision – Finally Rashad Suga Evans returns after 2 cancelled fights. He’s looking for his first win since beating Chael Sonnen back in 2013. He takes on Olympian Dan Kelly from Australia. Kelly has a 12-1 record, but Evans is certainly his biggest fight to date. We don’t see a classic, but we do see an overdue Evans win. As mentioned before the fight was called off due to Khabib having issues cutting weight. No last minute opponent could be finalized for Ferguson. Khabib Nurmagomedov by Decision – Hopefully this will be the last Interim title fight for a while, but it’s an least an official number one contender slot. Khabib Nurmagomedov has a flawless 24-0 record, his issue injuries and a lack of big name victories. Tony Ferguson won the Ultimate Fighter 13 in 2011 and has only lost once since then, winning countless fight of the night etc bonuses. A close fight on paper, two different styles. But we see Khabib winning in the 5 rounds by decision. Tyron Woodley by Decision. main event time Tyron Woodley is an underrated fighter, many say boring but he has fought the best of the best in the division. Steven Thompson is a likeable and genuine guy, he hasn’t lost in 5 years, and beat both Johny Hendricks and Rory MacDonald in the last 12 months. His issue is his ground game. Honestly a predicted finish would be great but overly hopeful, honestly we’ll be happy as long as it’s not another draw. We see Woodley doing the same as last time, but with a little more energy. As always if you have any questions about UFC 208 and/or anything else please feel free to let us know. Either below by Email or via Twitter or Facebook.